Delicious: A green skin pomelo orchard in Bến Tre Province. VNS File Photo. MEKONG DELTA --Representatives of farming co-ops and the Cultivation and Plant Protection Division under Bến Tre Department of Agriculture and Rural Development this week discussed measures for sustainable development of green-skin pomelos and rambutans in the province at a seminar. Bến Tre has more than 5,600ha under rambutan, mainly in the districts of Chợ Lách and Châu Thành. A fifth of the total area grows the fruit, and produces more than 107,000 tonnes a year. Three rambutan processing firms have been set up in the province in the past few years, and recently Bến Tre rambutan were exported to China, the United States and Europe. But the Châu Thành-headquartered Tropical Fruit Export Ltd. is the only firm to sign a contract to buy the fruit, the partner being a local co-operative. Sơn Định Commune in Chợ Lách District has one farming co-operative and 17 co-operative teams growing the fruit over 500ha, but they have signed no agreements to sell their output. According to Lý Tấn Phương, chairman of the Sơn Định Commune Farmers’ Association, it is difficult to sign sales contracts for Sơn Định rambutan because of price volatility. The prices vary from VNĐ5,000 – VNĐ6,000 per kilogramme at harvest time to VNĐ20,000-30,000 in other seasons. Nguyễn Thị Hồng Thu, director of rambutan export company Chánh Thu Ltd., said no long-term contracts had been signed between farmers and buyers because prices changed greatly and the fruit could not be preserved for long. With 27,700ha of fruit orchards, Bến Tre grows many iconic fruits of the Mekong Delta, including the green-skin pomelo. 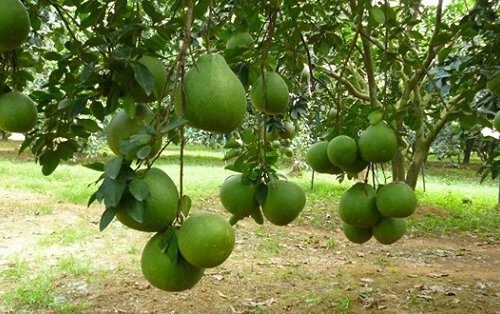 It has over 7,200ha under this fruit, mainly in Bến Tre City and the districts of Châu Thành, Giồng Trôm and Mỏ Cày Bắc, and produces 57,000 tonnes a year. But only 35.4ha of orchards grow the fruit for export. Đàm Văn Hưng, head of Hương Miền Tây Ltd., said the export of the famous Bến Tre green skin pomelo faced challenges because the small scale of production led to inconsistent quality. Lâm Văn Lĩnh, deputy head of the Bến Tre Cultivation and Plant Protection Division, said green skin pomelo and rambutan were mainly consumed in the domestic market and their exports faced challenges due to buyers’ stringent requirements. Green skin pomelo and rambutan are mainly consumed as fresh fruit with only a small proportion of pomelos being used to make juices, jams, wines and other kinds of foods. This is why their value has not been fully exploited yet, Lĩnh said. The huge demand for rambutan in the local market has not been met, he said. Hương Miền Tây has signed contracts to buy nearly 1,238 tonnes of green skin pomelo a year on 277ha in Bến Tre Province. It plans to establish a quality management team to help co-operatives develop a production process and quality standards to meet market needs. It will sign purchase contracts with growers at market prices while demanding that they ensure clean standards and steady output. The province’s cultivation and plant protection division has co-ordinated with district authorities and other relevant agencies to establish green skin pomelo and rambutan co-operatives. In Bến Tre, there are now 109 co-operatives growing pomelo and 42 growing rambutans. Sixteen contracts have been signed by processors to buy the pomelos, but farmers growing 13,500 tonnes of the fruit on nearly 500ha have yet to sign up. Not a single contract has been signed with rambutan farmers, Hưng said. According to Phan Thị Thu Sương, deputy director of the Department of Agriculture and Rural Development, only a few contracts have been signed between Bến Tre farmers and firms due to the small scale of farms and the inconsistent quality of the fruit.